In the past, we have been lucky enough to have done several jobs for Stanley and Sons Construction Company. Last Spring, we were contacted by their Vice President, Tom Gooby, to help him bid on a job he had at a local mall, Sugarloaf Mills. Sugarloaf Mills had been undergoing a major renovation, and part of the project was to update one of the main entrances. This project included removing several structures and updating the sign faces that had been at the mall since its opening in 2000. We were excited about making the mall’s appearance fresh with original signage that would draw in new customers just in time for the holidays. The sign faces were made with a banner type of material that stretches over sign frames called Flex Face Signs. This creates a clean and dynamic look, and is also the most economical way of covering large structures. The sign faces for this job were 6 feet wide by 28, 32, and 36 feet tall for the three structures. We provided Tom with a quote and in the early fall we were told that Stanley and Sons had won the bid. We had to go out and remove the existing sign faces so that the contractor could paint the sign frames. 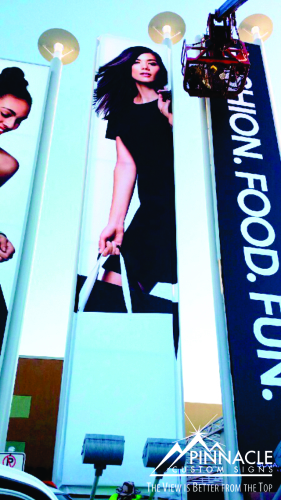 Working with the graphics crew at the mall management team, we came up with graphics that would print well and still enlarge to the massive sizes we were looking to create for the frames. We then ordered the flex faces from our good friends at Royal Printing Solutions in Colorado. Once we were able to obtain the large sign faces we scheduled for the final flex face sign installation. To complicate things a little, we had to do it before mall hours to not impede mall traffic, but we were able to have them up and ready for the first customers that morning. This flex face sign project was a good example of coordination of activities between our company, our subcontractors, and the General Contractor of the renovation project. 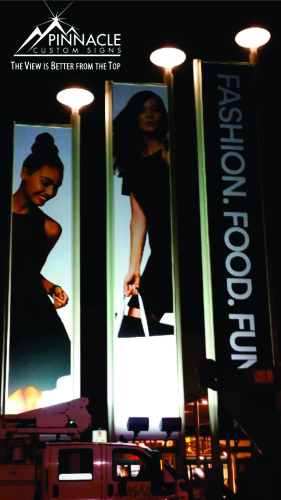 The result was an amazing and trendy look that is bound to grab shoppers’ attention. We look forward to continued work with Stanley and Sons.